Here is a great slow cooker recipe if you like a little spice! The chicken had the great buffalo flavor and was super tender. 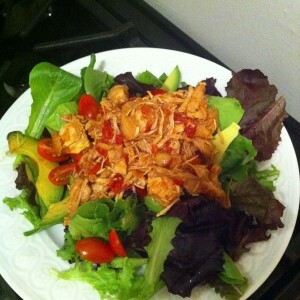 Instead of sandwiches, I served the shredded buffalo chicken over a simple green salad with tomatoes and avocado. I don’t care for blue cheese dressing but Tim thought it added a nice complement to the chicken. Note that there is about 15 minutes of prep time before you can set it and forget it. But there is nothing like coming home from work to dinner already prepared! Variation: You can also use the chicken filling in tacos or in a salad with blue cheese dressing. Cook’s Note: Use a potato masher to shred the cooked chicken in the slow cooker. Or, transfer chicken to a large plate, pull apart with 2 forks, then return to sauce. 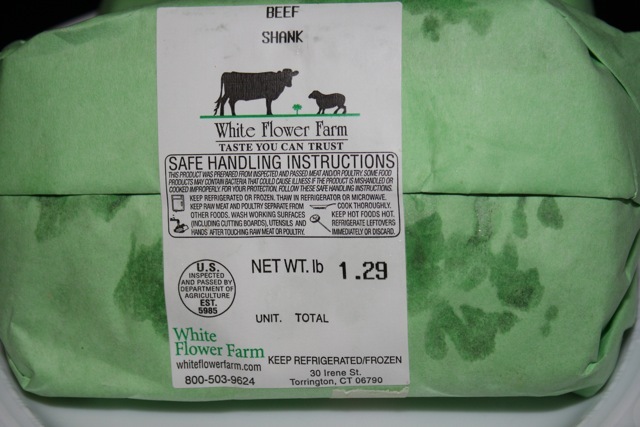 As I mentioned earlier, Tim and I have purchased another half-steer from White Flower Farm in Connecticut. Last year, we were amazed by the quality of the meat, how fun it was to find different recipes for the various cuts, and how quickly we actually ate our share! This year we’re only splitting the half-steer with Tim’s brother so it is a lot more meat! We have a small freezer in NYC so we’ve only made stew with the stew meat, tacos with the ground meat, and this “faux” osso bucco with two meaty shanks. 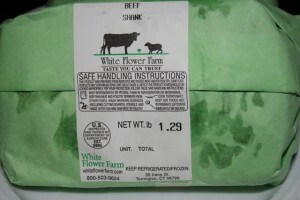 I love real osso bucco (braised veal shanks), but not everyone loves veal, it is expensive, and can be hard to find in your typical grocery store. 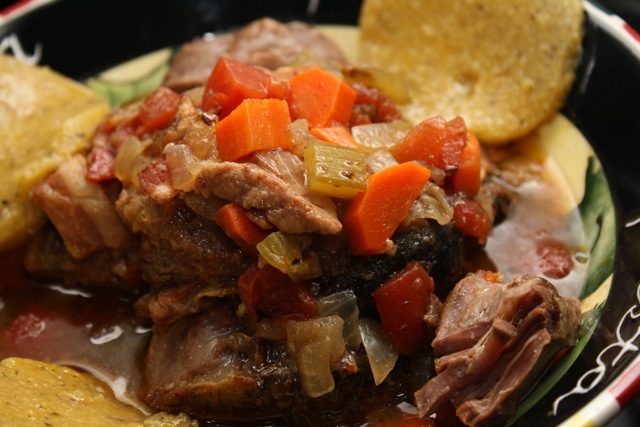 This recipe using the beef shanks is delicious and full of flavor! I opted for the slow cooker preparation. 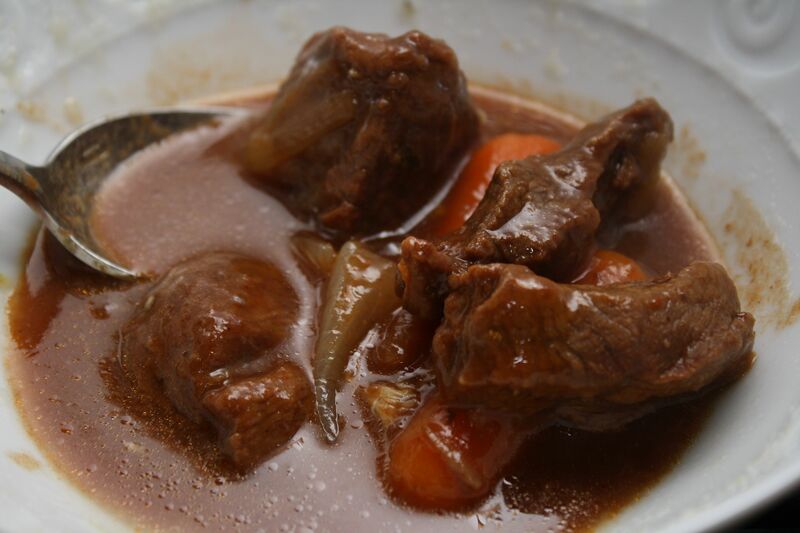 But because I only had two very large shanks, as opposed to the four called for in the recipe, I cooked the dish for 7 hours on low. It turned out perfectly! So tender — the meat just falls off the bone. I would recommend serving over polenta, mashed potatoes, or pureed cauliflower. Because we had this on a weekday, I just sliced and heated some polenta in a frying pan. The sauce is definitely something you want to mop up with crusty bread or pour on a pile of mashed potatoes! Season the beef with salt and pepper and dredge in the flour. Working is batches, brown the beef in the oil and butter until the shanks are golden. Medium high heat in a large deep skillet. Remove shanks from the oil and butter and set aside. In the same pan, add the onion, carrot, celery, bacon and garlic. Saute over medium high heat until veggies are tender – about 7 minutes. Add the wine and turn up the heat slightly to reduce the liquids. Another 6 minutes or so. Add broth, tomatoes and salt and pepper to taste – about a tsp of each. Add the veggies and beef in layers to a slow cooker and cook on low for four hours or until tender. In a small bowl combine the chopped parsley, garlic and lemon zest. Add either the pot or the slow cooker for the final 10 minutes of cooking. Serve over polenta, rice or mashed potatoes. 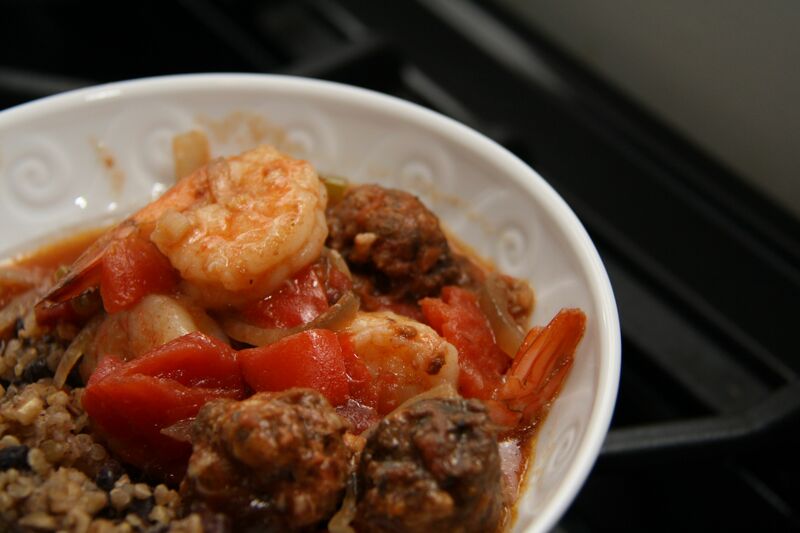 Here is another slow cooker recipe! This is a Mexican-style chicken and beans recipe. There is a little heat from the chipotle peppers in adobo sauce and you can add extra spice or reduce the spice depending on what type of salsa you use. I made a few adjustments when I prepared this yesterday. I used 1 red bell pepper and 1 yellow bell pepper. I also used two cans of pinto beans, rinsed and drained. The beans were probably a little too soft but I didn’t have dried beans on hand. I also only used 6 chicken thighs because that is what I had in the fridge. I have made the recipe before and it is less soupy than it appears in the photo when you use the 8 thighs. 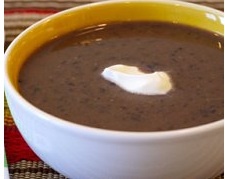 Enjoy this dish with rice or some warmed tortillas! 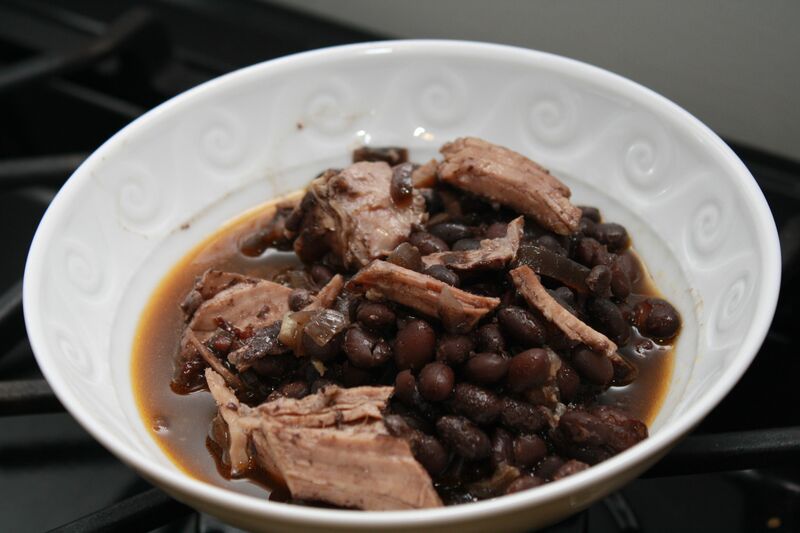 In a 5- to 6-quart slow cooker, stir together beans, salsa, chiles, flour, and 1 cup water. Season chicken with salt and pepper; arrange on top of bean mixture. Scatter onion and bell pepper on top of chicken. 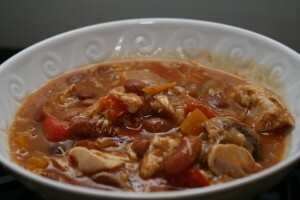 Remove chicken from stew; shred into large pieces and return to stew. Serve topped with sour cream and cilantro. I had one last package of short ribs from our half-steer and decided to cook them yesterday in the slow cooker. Tim loved this dish! And, I loved how easy it was to get dinner on the table. 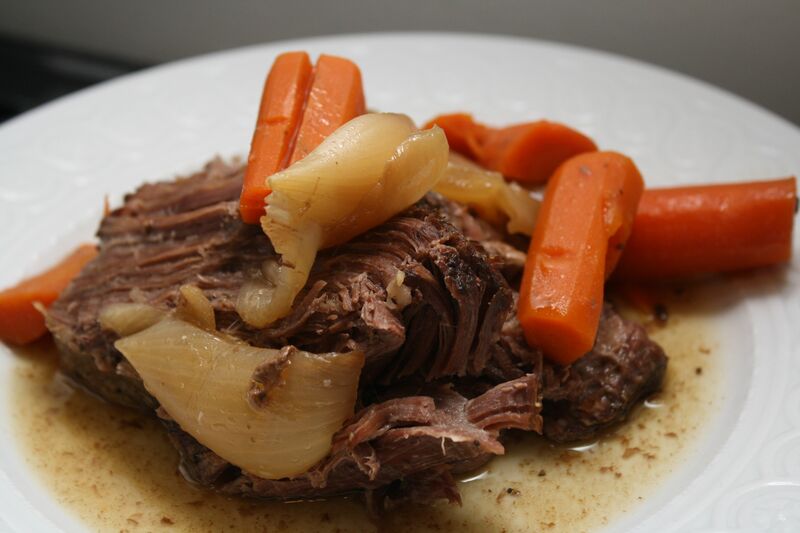 I think I prefer the traditional braising method, but you can’t beat how little work this recipe requires — only 5 to 10 minutes in the morning. We had the short ribs with some crusty bread. Mashed potatoes, egg noodles, or pureed cauliflower would be great sides as well. 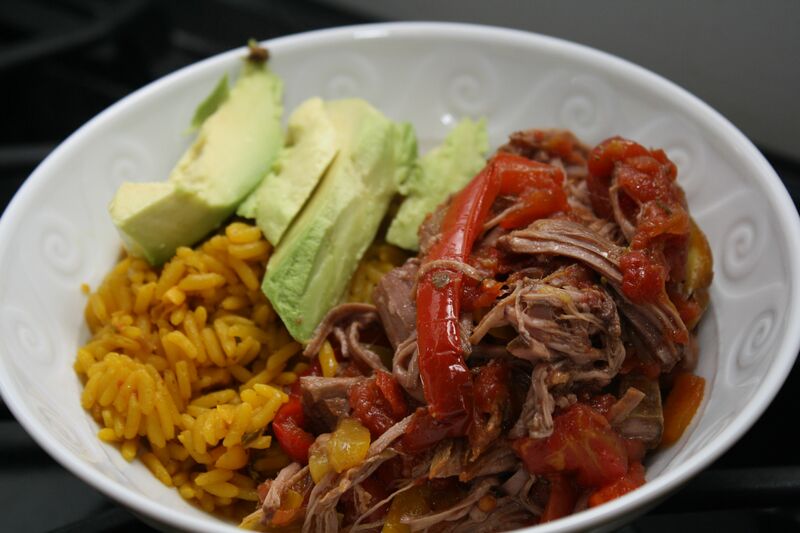 I need to find some new slow cooker recipes because it is so nice to have dinner ready and waiting for you in the evening! In the bowl of a slow cooker, combine the onions, garlic, carrots, parsnips, mushrooms, tomatoes, and sage. Season the short ribs with 1 1/2 teaspoons salt and 3/4 teaspoon pepper and nestle them among the vegetables. Add the wine. 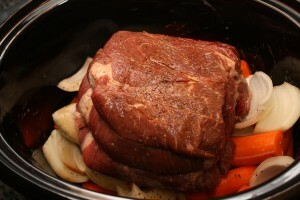 Set the slow cooker to high and cook until the meat is tender and falls from the bones, 8-9 hours. Using a large spoon, skim off the excess fat and discard. Divide the ribs and vegetables among individual bowls and spoon the sauce over the top.